The next issue of Fremontia will focus on the Urban Wildlands of California. 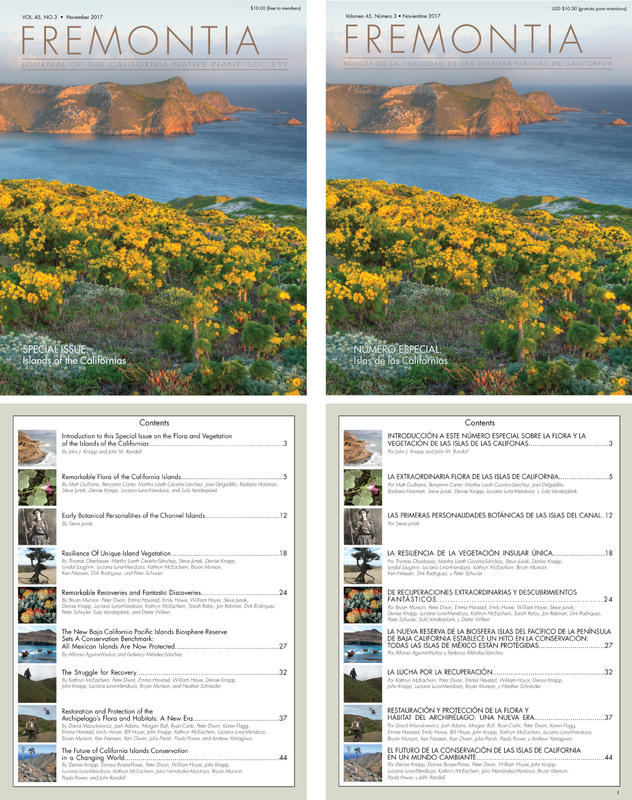 Please vote and help us choose the front cover! Expect it in your mailbox in early May 2018. Fremontia V45 N3 is printed in English and Spanish. After a childhood enchanted with island literature, aptly including Island of the Blue Dolphins, it took nearly 20 years to find myself on a real island. While teaching for the Los Angeles County Outdoor Science School, I ventured to Santa Cruz Island in 1998 with ten other young, eager naturalists. Marooned for the weekend, we gained our first place-based experiences with island biogeography while hiking and kayaking. On this adventure we witnessed island endemics including island scrub jay (Aphelocoma insularis) and island fox (Urocyon littoralis). Checking these and other species off our life lists, our appreciation for island time deepened over a sunset staring back at the mainland—our love for biogeography was burgeoning. Around a campfire under the eucalyptus at Scorpion Canyon we pondered speciation events, biogeographic patterns, and the audacity of invasive species. Falling asleep that evening, I contemplated my study of Lord of the Flies in high school and further understood all the mainland offers an island. The North Coast Chapter of the California Native Plant Society (CNPS) is offering a research grant (2 awards per year) of up to $1,000 for studies of local, native plants. The grant is available to undergraduate and graduate students at Humboldt State University and College of the Redwoods. Its purpose is to encourage learning about native plants in Humboldt, Trinity, Siskiyou and Del Norte Counties and to support projects that will advance knowledge of them. CNPS has begun a collaborative mapping and inventorying project for yellow-cedar in California. The species is a CNPS Inventory of Rare and Endangered Plants on list 4.3 (limited distribution) in the state, with only a handful of known locations. The majority of the stands are on the Klamath National Forest but a few are also on the Six Rivers. Over the course of summer 2017, Michael Kauffmann and Julie Evens will be visiting a number of these populations and collecting data on stand health, reproduction, and plant associations. The week of July 5-6 we visited the world’s southern-most stand, deep in the Siskiyou Wilderness. Range of yellow-cedar in California. 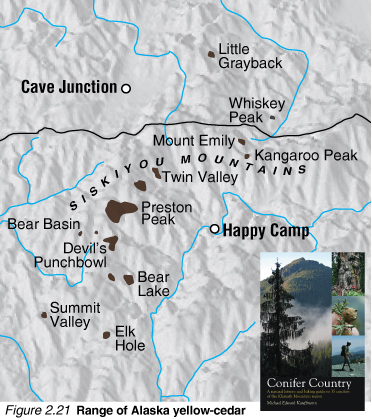 Map from Conifer Country (Kauffmann 2012). This project was initiated by Forest Service Region 5 when we were contacted by Brian Buma from University of Alaska. His research is showing that yellow-cedar at the northern extent of its range is in declining health and not reproducing. The baseline data we collect this summer will inform future studies across the range of this species.